Set sail for some high-seas fun on the Cruise Ship! Relax in your spacious guestroom, complete with beds, a sitting area, and private bathroom. Simply pull out the lower deck for easy access and, in doing so, reveal a staircase leading to the upper deck. The top deck offers a great place for sunbathing, thanks to the lounge chair and open-air seating area. When you're done relaxing in the sun, glide down the slide into the refillable pool below or stop by the restaurant for a snack. The floating life boat ensures that guests have a safe cruise. 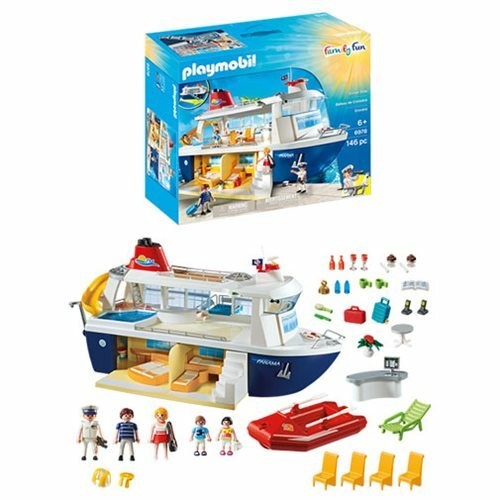 Upgrade the lifeboat with the PLAYMOBIL Underwater Motor (sold separately) or integrate the Singer with Stage ( sold separately) for an even bigger vacation experience. Set includes three adult figures, two child figures, life boat, lounge chairs, luggage, furniture, food, beverages, and tons of other accessories. Recommended for ages six and up. Dimensions: 29 1/10 x 14 1/5 x 8 1/3 inches.Warning. Choking Hazard. Small parts. Not for children under 3 years.